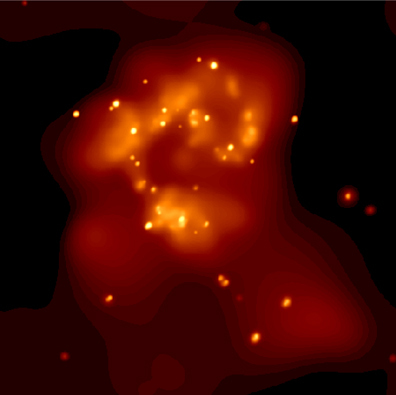 This Chandra X-ray image of the Antennae (NGC4038/4039) shows the central regions of two galaxies in collision. The dozens of bright point-like sources are neutron stars or black holes pulling gas off nearby stars. The bright fuzzy patches are superbubbles thousands of light years in diameter that were produced by the accumulated power of thousands of supernovas. 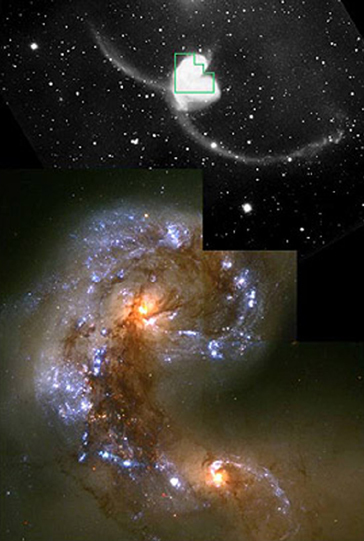 The remaining glow of X-ray emission could be due to many faint X-ray sources, or to clouds of hot gas in the galaxies. The Antennae Galaxies, about 60 million light years from Earth in the constellation Corvus, got their nickname from the wispy antennae-like streams of gas seen by optical telescopes. These wisps are believed to have been produced by the collision between the galaxies that began about 100 million years ago and is still occurring. Although it is rare for stars to hit each other during a galactic collision, clouds of dust and gas do collide . Compression of these clouds can lead to the rapid birth of millions of stars, and a few million years later, to thousands of supernovas. The expanding bubbles of multimillion degree gas produced by the supernovas can coalesce to form superbubbles. Scale Image is 4 arcmin across.